Nothing says "Let's Get Dangerous!" like a nice frilly frock, are we right, girls? No Magical Girl can be complete without a spiffy costume, decked out with frills and bling. While there are a huge variety of styles when it comes to such costumes, the pervading theme seems to be colorful, very girly, highly unlikely fighting gear meant to appeal to Rule of Cool, Rule of Cute, or Rule of Glamorous and whose impracticality never seems to get in the way of their ability to take out the bad guys. Impossibly Cool Clothes is definitely in effect here. Usually Suspension of Disbelief is required to believe such a costume is ideal for fighting, though occasionally there will be a Handwave in the form of an explicit mention that the protection of the outfit is magical. A frilly skirt or dress. An overwhelming majority of the time this is a short dress, almost never below the knee. "Frilly" can mean pleats that echo the schoolgirl Sailor Fuku, large ballerina tutu ruffles, flowery fairy-style skirts, airy poofy skirts...and so on. More rare is a tight miniskirt or short shorts. A distinctive, bright color scheme. Pinks and other pastels feature heavily but by no means have a monopoly. The Dark Magical Girl gets lots of black added to the palette. A team of magical girls will usually be Color-Coded for Your Convenience. Ribbons. It could be a Giant Waist Ribbon, it could be a prominent bow on the chest, it could be hair ribbons (see further down), it could be other ribbons that look cool when the girl is twirling in her Transformation Sequence. Accessories and jewelry in an assortment of recurring motifs: hearts, stars, flowers, butterflies (especially Butterfly of Death and Rebirth and as symbols of metamorphosis that fit well with growing girls) wings and gems. A signature accessory, rod, wand or weapon decked in the same motifs. A Transformation Trinket, which may be the same item as above. It too may transform and integrate itself into the costume. Bare Your Midriff - A trait that is becoming more popular recently, mainly for older characters. Good Colors, Evil Colors - Pink is the team leader with Red usually being The Lancer, all black usually means Dark Magical Girl. Leotard of Power - Almost never alone, usually combined with the skirt. Minidress of Power - A typical form for these outfits is a short dress. Sailor Fuku - Codename wa Sailor V and Sailor Moon are the first and most obvious examples but as iconic as they are on Japanese schoolgirls, echos of them appear in other designs. Cool Crown - A princess tiara or some form of circlet, specially if the Magical Girl has a princess origin story. Some form of short cape. High Class Gloves - Even if the characters aren't high class, their outfit is often meant to evoke that image. Other elements may include items from the Cute Witch motif, (i.e. a witch hat, which at one point was what Magical Girl meant) and echoes of actual armor, like shoulder pads, arm bracers and such, though rarely actual armor. Magical girls who go through a mid-season, new season or plot-related power upgrade will often get a Frilly Upgrade for their costume to match. A Sub-Trope of both Pimped-Out Dress and Impossibly Cool Clothes. This trope applies to Magical Girls only for anything else, please consult Costume Tropes. 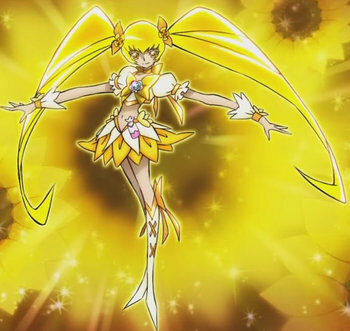 Cure Black ◊ her Bare Your Midriff caused quite a stir amoung Moral Guardians as a result it is covered up in Season 2 ◊. She is the only one in the entire 8 seasons to not get Every Girl Is Cuter with Hair Decs. In the first movie her outfit gets a golden color, and her earrings and other small hearts on her clothes become diamonds. In the second movie Her outfit ◊ takes on a Feather Motif. In Pretty Cure All Stars DX 2 her Cure Rainbow Black form resembles this but without the Feather Motif. 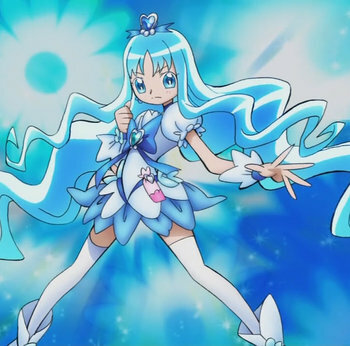 Futari wa Pretty Cure Splash★Star Unique in that there is no real Mid-Season Upgrade the costume change is a complete form change with just different powers. Dark Magical Girl duo borrow powers to become the new Cure Bright ◊ and Cure Windy ◊ they get almost no frills. Yes! 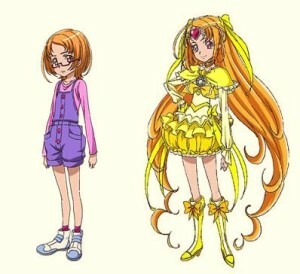 Pretty Cure 5: A butterfly motif dominates the costumes. 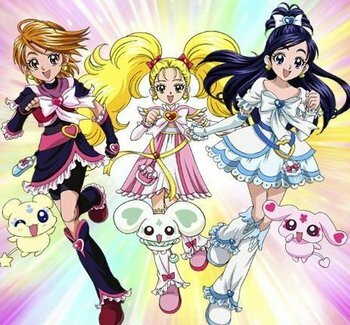 All pretty much follow the same design just Palette Swap gaining jackets in season 2 and a few frills for the first movie with Butterfly wings the only unique one is Shining Cure Dream from the second movie. Dark Pretty Cure 5 ◊ total copies of the originals but since they are evil they are completely lacking in frills. 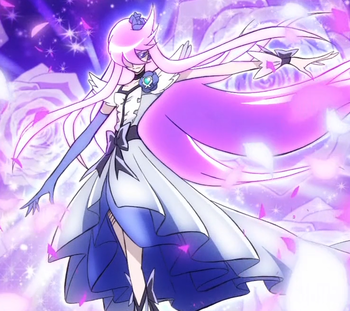 Cure Passion ◊ Angel Passion ◊ and before as a as a Dark Magical Girl ◊ completely lacking in frills. Heartcatch Pretty Cure Flower Motif is the king here. When they gain their super forms their skirts bloom. Cure Moonlight ◊ Super Cure Moonlight ◊ is unique in that she is from the previous generation of cures, her outfit is quite different than the others she does not use a mini skirt but a cut open dress, and uses two color motifs instead of the usual one, purple and silver. 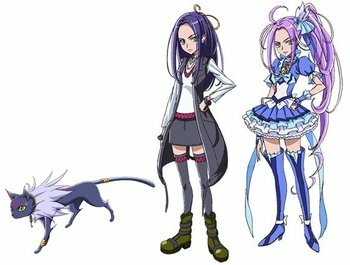 Her Fashionable Asymmetry matches up with Dark Pretty Cure ◊ hinting at their connection at they are two halves of the moon and other things. Suite Pretty Cure ♪ Music is the theme here. Cure Muse ◊ playing the Dark Is Not Evil Mysterious Protector she gets next to no frills however its going to come off with lots of frills ◊ once she truly becomes a good girl. 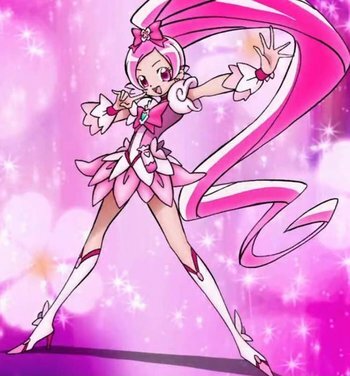 Cure Beat ◊ gets frills when she does a HeelFace Turn. Watch it! Don't ruffle her costume or hair: they play guitar riffs when touched. The girls of Smile Pretty Cure! all share a Feather Motifs with lots of little variations to their outfits like everyone has a half skirt tied on their back in a different shape, different shaped Chest Bow the Tomboyish Cure Sunny and Cure March are lacking in the frills a bit on their skirt and shoulders for easier action and Cure Sunny is the only one to wear Zettai Ryouiki. Sayonara, Zetsubou-Sensei\'s Magical Girl Spoof Model Warrior Lily Cure ◊ plays it as straight as can be however for once the one in pink is not the leader. Ayumu ◊ (yes a guy....) and Haruna the Magical Girls in Is This a Zombie? with a theme of bows lots and lots of bows for their Frilly Upgrade they gain Heart Symbols and as they put it "Were getting cuter!" In Mahou Sensei Negima! the Mahou Shoujo Biblion series with a Magical Girl duo Biblio Pink Tulip Ã¢â¢Â¥ and Biblo Red Rose Ã¢â¢Â¥, the Magical Girl costume is Standard Sailor Fuku with Cat and Rabbit ears and tails respectively. First appears in an Imagine Spot with Nodoka and Yue, Makie and Ayaka wear the same outfit later on for the Cosplay and the fight in side the computer system. Chisame cosplays as "Rouland Rouge" its suppose to be the Dark Magical Girl of the series, outfit is a Black Sailor Fuku with black kitty like ears, bat wings, and a devil's tail with Zettai Ryouiki the character is suppose to be very innocent "shy crybaby" supporting the personality of Zettai Ryouiki. The outfits in Lyrical Nanoha have distinct military elements, but also have some more traditional elements in their design. For example, the main character Nanoha Takamachi wears a dress with Giant Poofy Sleeves. In Puella Magi Madoka Magica, Madoka's magical girl outfit is closest to this. The other girls have elements in their outfits though. The title character of Nurse Angel Ririka SOS wears a pink and white costume with an airy skirt while transformed into Nurse Angel. The Magical Boys of Cute High Earth Defense Club LOVE! wear these when they transform into the Battle Lovers. The uniform includes a puffy-sleeved vest, a frilly shirt, a giant chest bow and a heart-shaped brooch, all in white and pastel colors. In contrast, the Dark Magical Boys of Caerula Adamas and the Vepper Twins wear prince-like black outfits. In the sequel, Cute High Earth Defense Club Happy Kiss!, the Happy Knights wear hooded outfits with pantaloons, small chest bows, puffy sleeves, curly-toed boots and wrist-length gloves. Wonder Woman And The Star Riders: Wonder Woman wears a tutu-like skirt with a lacy underskirt, star print tights, and a cape, vambraces, boots and top in magenta. Dolphine's got blue and teal tights, a skirt made of lace with a sparkly cape skirt in back, a crown-like hair piece, and a scalloped edged neck covering that looks like a tight-fitting gugel that's had the actual hood removed. 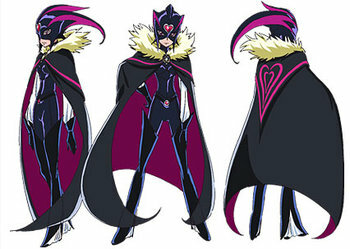 Ice is essentially a palate swap of Dolphine with a different skirt and the neck covering transformed into the top of a cape. Star Lily is wearing a gigantic flower made of lace on her back, flower accents and a multi-layered skirt. Spoofed by Agents of the Realm - while the dresses are nice and appreciated, the first time the girls have to pursuit a monster on foot, they have to pause and disentangle the frills from the branches of the forest they are running through. Apricot Cookie(s)! : Starlet Pony's magical girl outfit is a large, fluffy dress with roses pinned in her hair. Played straight in Leif & Thorn - you can get a rough idea of a magical girl's power by how fancy and bejeweled their outfit is . The Winx Club - some of their fairy forms are very frilly.